I haven't been free to write here for a month or so - my mother fell and has been hospitalized and then in a nursing home. At 94, I knew she would be slow to heal, and I knew the system would not question where she was until her medicare time limit ran out, but I did not expect her to get worse in the nursing home. She has gone from an active, alert nonagenarian who was on her way to get into her car to drive to a bingo game, to a barely awake bedridden nursing home inmate. I have been visiting for hours every day, bringing her laundry home, taking candy favorites to her, and playing cribbage with her every evening until now she doesn't even want to sit up to play cards and has phantom pains all over her body, legs, arms, etc. I discovered last night that she was put on a narcotic pain killer around the clock - and it's destroying her. I am hoping my insistence that she not be given any more pain killers will make a change. 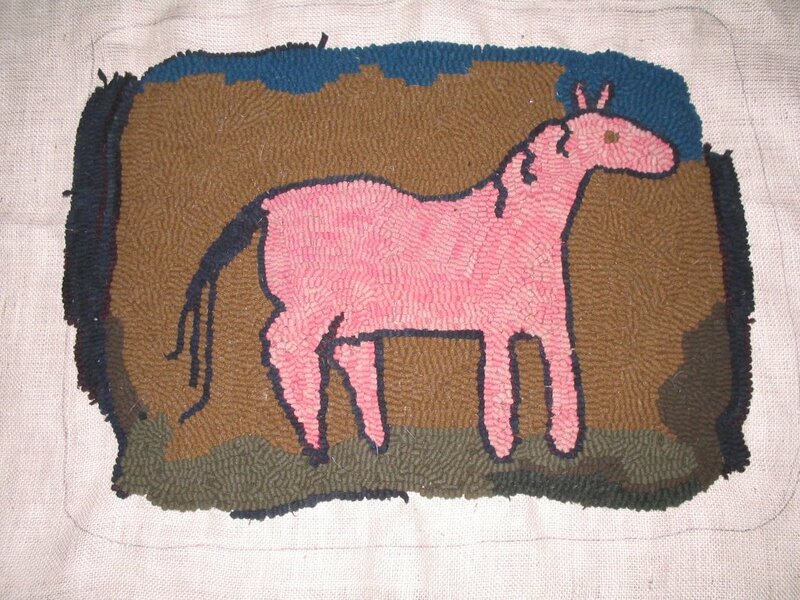 I started a rug the first few days when she was in the hospital and have been trying to bind it for the last week. I was hooking in very little light in the hospital and my loops are pretty ragged. I can't decide whether to leave the bad loops in or rehook them. I wanted the rug to look primitive - not just like pioneer primitive, more like caveman primitive. 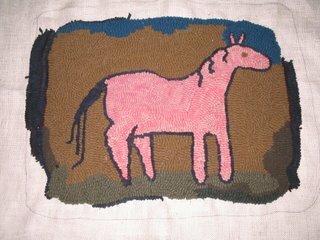 The photo was taken before I finished hooking the ragged black border and the horse isn't really pink, its hooked with wool that was tan overdyed with red and then bled so there was only a little red left on each strip. Just wanted to tell you how much I am enjoying your blog. I am originally from Jackson, MI, your photos of your studio building bring back very fond feelings. I'm new to rughooking and am having a devil of a time locating other rughooking blogs. Do you know of any more? VERY interested in your thoughts about how you like your frame with the tack strips as I don't have a frame yet. what a lovely rug, I love the soft, primative "curve" of this horse....makes me want to just keep looking. I hope that your hooking is helping you to cope with lifes changes. Best wishes.